From the front of the church, please enter using the far left door. The doors on the right are not accessible due to damages. Once you enter the church, there are stairs that lead up to the foyer on the main level followed by five (5) steps that provide access to the church sanctuary. Parking for this entrance is available across the street. If you are physically challenged by stairs, please continue down the page for information concerning the handicap entrance. Parking for the front entrance is available across the street. During inclement weather, drivers may pull parallel to the church doors to drop off passengers. If you are physically challenged by stairs, please continue down the page for information concerning the handicap entrance. The main parking area is accessible through the alley after turning on to either Enoch (from the west) or Emmaus (from the east). If the parking lot is full, there are additional spaces across the street (more parking) and in the handicap parking lot. As a last resort, parallel parking on Enoch or Emmaus is also available. The parking lot entrance is at the junction of the two buildings. If you are physically challenged by stairs, please continue down the page for information concerning the handicap entrance. 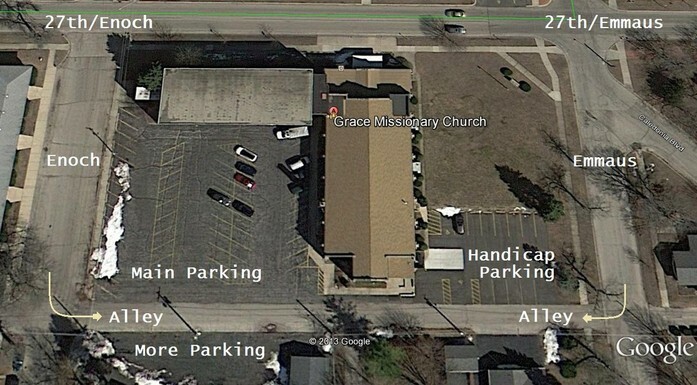 Handicap parking is available on the east side of the building. The entrance is a sheltered concrete ramp that leads into the church. After entering the church, continue forward until the elevator entrance is visible to the left. The key by the elevator door provides access to the elevator. Once inside, there is another key in a slot on the elevator wall that operates the elevator. Once the elevator has risen to the sanctuary level, please turn off the key on the elevator wall and proceed through the hallway to the right to gain access to the sanctuary. If you call the number on the Home Page or send us an e-mail to inform us that you are coming to visit and want handicap assistance, we will have someone standing by the handicap entrance (or just inside during foul weather) to provide help and operate the elevator.